New evidence suggests that East African honeybees may hold the key to conquering Colony Collapse Disorder (CCD), a widespread condition afflicting honeybees in the west that causes them to leave their hives and die off mysteriously. Billions of bees have perished from CCD since 2006 due to a wide variety of factors including pesticides and deadly parasites and pathogens that the weakened immune systems of the bees are unable to fight off. Surprisingly, recent studies reveal that East African bees living in Kenya have been exposed to the same parasites and pathogens as bees affected by CCD, yet the Kenyan bees demonstrate almost no ill effects and continue to thrive. Since the onset of CCD in 2006, beekeepers have lost tens of millions of hives, while the industry has taken a hit of over $2 billion. The mass devastation of bees has had wide-ranging effects, including the loss of many crops that could not be properly pollinated. 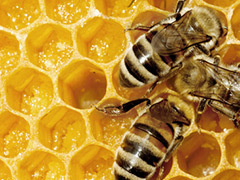 Pesticides play a large role in CCD, as some of the chemicals weaken the bees’ immune systems. Bees also contend with the stress of being moved from place to place, in addition to the fact that commercial hives frequently use queen bees imported by mail to beekeepers, as opposed to allowing the hierarchical structure to develop naturally. All of these factors have lead to an enormous drop in resilience among domestically kept hives, leaving them vulnerable to deadly parasites such as Varroa mites. In addition, viruses can often partner with the parasites to form an even deadlier combination of bug. Varroa and other parasites have also been discovered in the Kenyan bees, however, because of their lack of exposure to pesticides and the other stressors named above, their resilience remains extremely high and they have not succumbed to the normally deadly parasites. The study of these East African bees will be ongoing, and there is already talk of using breeding to strengthen the resilience of domestic bees in the west. Until then, researchers hope this new discovery will continue to provide insight and answers to the mysteries of CCD, which has burdened both the environment and the economy for far too long.